We all agree that physical activity can do wonders to kids. It not only improves their torso and gives fitness but draws a fine line for their motor skills to develop while helping them stay focused and avoid stress with that extra adrenaline secreted. Exercise helps them eat well, sleep, and since they are out of the home, they are away from the distraction of video games and cartoons and anything that makes parents hair go up in anguish! My better half is an active individual and fortunately my preteen got those genes from him, as he wants excitement or some sort of activity outdoors. Sometimes I am their partner in the above surroundings but at times put the blame on my To-Do things in the kitchen and the enormous household chores that help me take the back seat from the open air. However, both boys are out and about getting their clothes and soles messy either over a game of baseball or running. 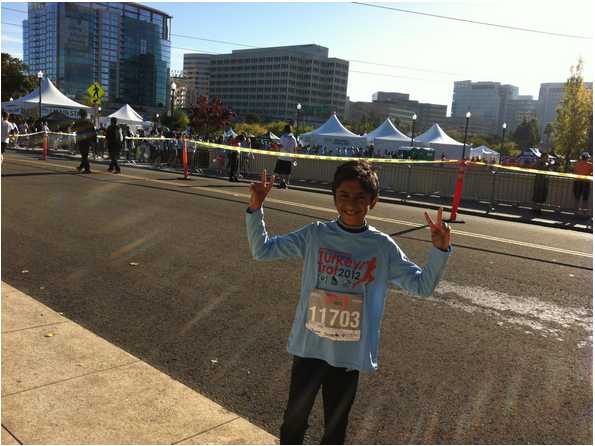 Lately to create awareness of good health and to raise funds for various projects that touch many unfortunate lives, people have been combining these two and running for a cause.My brat who loves to race anybody joined in the venture. He has the love for running, and I can see his state of excitement post work out, and how his lean and tall physique never complains even though out of breath cause the love of feeling the wind on one’s face is exhilarating. However, the training to these runs has been tough. He hates getting out of bed early morning and also the day after the run the sweet pain in the legs that make him slow down is bothersome for him as he frets over it repeatedly. I have been nicknamed as a tiger mom by my family for that brief period in the morning since I literally pull him out of the bed to which he despises each day of the run, but then it has ended with a hug from him and thanking me for taking that action. Many charitable organization sponsor runs to raise money and bring awareness for that particular cause. His passion has made him not only secrete those endorphins and get that rush of excitement within him, but has also made him aware of the problem and run for something greater than himself. In the end, when the amount raised is announced, the pride is invigorating, and his passion to do more such runs keeps getting better by helping to improve his own personal record (PR). This journey started with his school raising funds for children in Zimbabwe where the children were trained to run for a mile. He climbed the ladder to 5 kilometers for a couple of years and is currently unraveling 10-kilometer races while eyeing for half marathons. With so many distractions surrounding us, having a goal helps an individual stay focused on the finish line while helping for a cause with the hopes of accumulating some karma points. ← Learning In My Kitchen!